If our rental application is approved, we leave for Arizona in a week-and-a-half. How can it be that it is time to say goodbye to my home? But it is time. I’m planning to write goodbye posts to a few of my favorite parts of life here, tributes to a place that I have loved to my very core, but I don’t want to give the impression that just because it saddens me to leave the Pacific Northwest that I’m not excited about exploring the Southwest. The Sonoran desert has a unique beauty all its own and I have much to learn on many levels and I’m eager for the journey to begin. I wish I was already there. But even if the job was in a place I wasn’t excited about, what matters most is our little family will be together. When our plane landed Saturday night and we took our phones out of airplane mode, my wife had texts from our pet sitter that she and our three cats were at DoveLewis, our emergency vet. She had prepared Ellie’s pills by covering them with pill pockets, but when she let Ellie outside briefly to go to the bathroom one of the cats ate all of Ellie’s pills. With a long history of pet ownership this is not our first brush with an accidental poisoning, I shudder to think how many things Ellie ate in her first months with us as we learned the hard way just how low the bar our pup sets for what qualifies as food. And of course when I started this blog 12 years ago one of my first posts was about our cat Templeton swallowing a sewing needle right before we were leaving for a trip. Accidents happen, I’m sure all pet owners (and parents) have their own stories. Thankfully she got all three cats into their carriers (trust me, this is no small feat) and took them to DoveLewis so they were already getting treatment by the time we arrived. It would be easy to panic in a situation like this but I’m grateful she did exactly what was needed. We suspected Boo was the culprit but until we knew for sure all cats were getting treatment. They gave them medicine to get the cats to throw up but only Trixie cooperated, and she didn’t have any pills (or pill pockets) in her stomach as we suspected. Sam and Boo weren’t revealing their secrets and neither was talking so we left them overnight after talking with both the doctors there and the experts at the ASPCA poison control hotline (1-888-426-4435), while we took Trixie home with us. The brothers were given charcoal to absorb as much of the medicine as possible, Sam never showed any symptoms but overnight Boo developed an elevated temperature and was anxious and over-reactive, one of the effects the ASPCA predicted, confirming our suspicions about the identify of the pill thief. Those symptoms cleared up by morning and by 2 p.m. they were cleared to come home. At this point we’re just monitoring Boo, he only ate half his food last night but ate most of it this morning although it took him two passes. He’s been a bit lethargic but not frighteningly so, he could just be recovering from everything he went through physically and emotionally. It could be because he’s upset I recycled all his Boo Boxes. He’s asleep on my legs at the moment, I hate to disturb him but the dog must be walked and I have more to do today than I have time to do. I’m thankful for my little ones, and so very thankful that we have the income to afford treatments like this when something goes wrong. And I’m deeply thankful for everyone who has looked after our little ones during our stay here, from the sitters to the doctors and everyone in between. We’ll have to find new people in Arizona to fill those roles, and will want to know a good emergency vet before we leave Oregon, one of the many little tasks to be done. But for now we’re all together and that makes me happy. 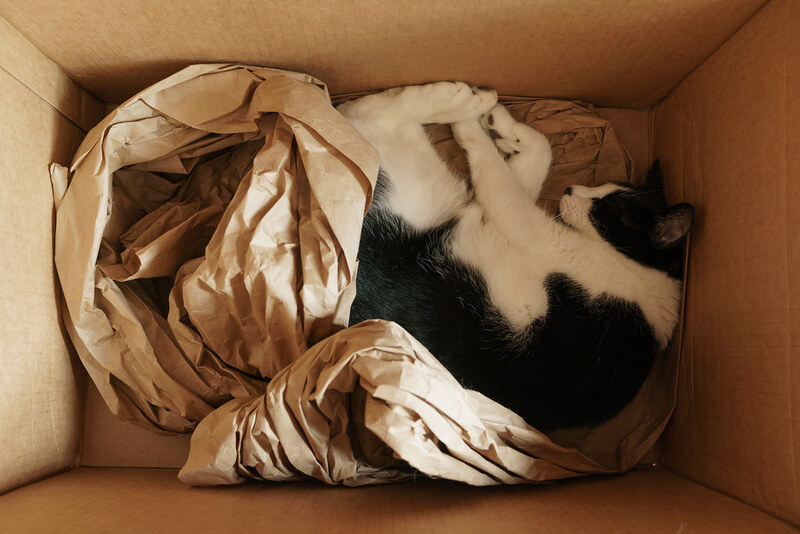 This entry was posted in Pets and tagged black-and-white cat, Boo, Boo Box, cardboard box, sleeping. Bookmark the permalink.